The day after writing about JLo’s ageless body and workout routine, I saw a commercial for her new workout and weight loss system called BodyLab. I’ll have to admit that the messages on the commercial pulls you in immediately. The marketing is genius! It lures you in with the image of JLo’s new, and close to perfect physique, while feeding you lines about becoming the person you were always meant to be. In part one of this review, we will dissect the BodyLab supplements to see if they deliver the results that their names describe. Take a peak at the video of the commercial for BodyLab below. This is a Q & A with Jennifer Lopez About BodyLab. If you have time I strongly recommend watching it! She relates to the average woman on so many levels and really talks with some encouraging words of advice. During this video, JLo talks about their 7 day detox kit to help you cleanse, detoxify, and restart your body. I took at look at the ingredients in the cleanse. It’s a combination of a detoxifying pill (which is purple), a thermogenic (to increase metabolism) and a probiotic (pink pill). The detoxifying pill does have ingredients to help cleanse the liver and the bladder but it also has many ingredients that flush the system and get rid of excess water weight. It’s probably easy to assume that you will loose some unwanted water weight using this pill and flush some toxins but don’t rely on it for long term weight loss. You may lose the water weight only to gain it back the next week. The fat burner in the BodyLab line is made up of all natural ingredients. 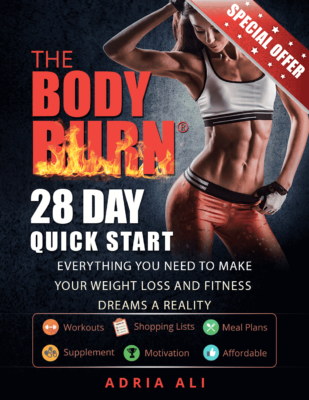 Many of the products are well known for their fat burning properties such as green coffee bean, and cayenne powder. It also has alpha lipoic acid, kola extract and citrus extract. This product most likely gives you a reasonable caffeine buzz. Like most thermogenics, this is to increase metabolism and give the uses a little bit more motivation to get moving. It’s not one that will make you feel like your on crack. It’s seems like a gentle push to get you moving with out wiring you. Fitness Tip – I do love that the capsules are not using gelatin. They use vegetables capsules made up of rice, and vegetables. While I love that this regiment includes a probiotic, there are many strains that do very different things to help cleanse the colon. The main probiotic used in this pill is Bacillus coagulans. Bacillus coagulans is a bacteria. It is used similarly to lactobacillus and other probiotics as “beneficial” bacteria. Diarrhea including viral diarrhea in children, traveler’s diarrhea, and diarrhea caused by antibiotics; digestion problems; irritable bowel syndrome (IBS); inflammatory bowel disease (IBD, Crohn’s disease, ulcerative colitis); Clostridium difficilecolitis; bacterial overgrowth; Helicobacter pylori infection; respiratory infections; cancer prevention; immune system strengthening; or as a vaccine adjuvant (source). * While I personally believe in using probitoics in the diet. I actually prefer using ones with more strains of beneficial bacteria. I also think it’s best if they are enteric coated. Enteric coated probiotics allow them to be released in the small intestines so that they are delivered there instead of causing stomach upset. These probiotics are in a vegetable capsules so they could potentially cause acid re-flux or stomach issues if you have a sensitive system. The Endurance Boosting Oxygenator most like does increase oxygen based on a well known Amino acid known as L-Arginine Alpha-Ketoglutarate. This amino increases Nitric Oxide (also known as NO). NO has been one of the most popular supplements on the market for many years now. It’s most well known for it’s ability to help you exercise longer. It does give you more endurance but it’s most popular for allowing weight lifters to lift longer. However, I assume this also applies to cardio exercise as well. Here is the break down if their product below. While many still use whey and hail it as the holy grail of all protein sources, I personally think that dairy is for baby cows 😉 . We are one of the only mammals that drinks the milk of another animal. Milk products also tend to be inflammatory agents and are hard for the body to break down and digest. They are also allowed to have a certain amount of puss in them while the cow is over worked and over milked. EEK! Read this previous article on that if you want more info. Help fuel lean tissue with this unique, super delicious, calorie smart protein shake for women. Adequate protein is critical for women in order to prevent muscle loss during weight loss, promote recovery after training, and to get toned. However, many protein shakes deliver more protein than a woman can use for these functions, effectively just loading her up on excess calories. TastyShake delivers 15 g of high-quality whey protein just for women, with less than 100 calories. The idea of these products are a cut above the rest when it comes to a complete plan. The use of a probiotic is awesome, I just wish it was a more complete probiotic. The protein idea is amazing but I wish it was a vegetable protein. The Oxygenator for workouts is an old idea with a cleaver name introduced to a new population of women. For woman who have never used a probiotic, an “oxygenator” and don’t eat enough protein, this could really benefit them. However, for me, these aren’t anything new and the other products I have in the cupboard are formulated better. They are reasonably priced and they allow you to get additional discounts if you subscribe to have the item auto shipped. We will follow up this review with one on the BodyLab workouts and recipes so keep your eyes peeled in the following weeks! that delivers fitness tips like these, daily, right to your phone! Good and helpful information. Thank you for sharing this with us.